Kareem Abdul-Jabbar won six MVP awards to go along with his six NBA Championships. The two-time Finals MVP was named an All-Star a record 19 times. He was voted to the NBA's 50th Anniversary All-Time Team and his No. 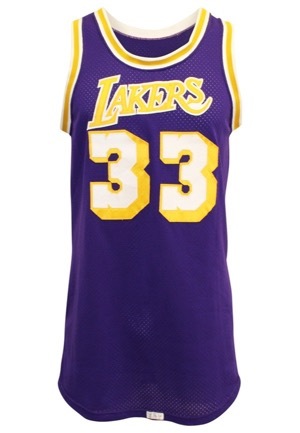 33 was retired by the Milwaukee Bucks and Los Angeles Lakers. At the time of his retirement in 1989, Abdul-Jabbar was the NBA's all-time leader in points scored (38,387), games played (1,560), minutes played (57,446), field goals made (15,837), field goal attempts (28,307), blocked shots (3,189) and defensive rebounds (9,394). He remains the all-time leading scorer in the NBA and is ranked 3rd all-time in both rebounds and blocks. 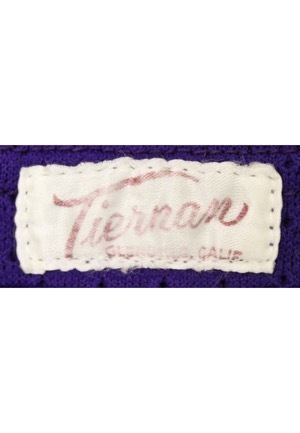 Centered on the front tail of the mesh jersey is the “Tiernan” manufacturer’s tag. 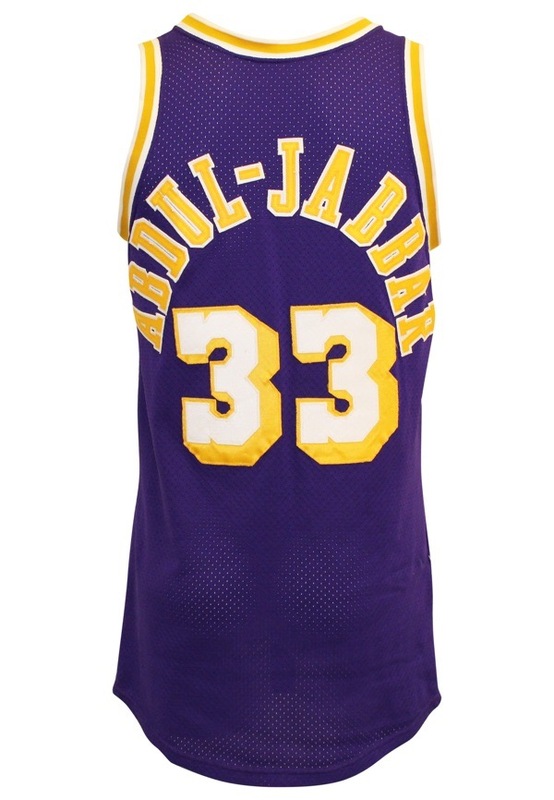 Across the front reads “LAKERS” and arched across the back is the player name “ABDUL-JABBAR”. These are done in gold on white tackle twill. Beneath on the front and back is the player number “33” done in white on gold tackle twill. This jersey is properly tagged, was presented to us as game-used and in our opinion shows appropriate use.